Award-winning artist, Margie Florini, works with unusual skill in many mediums. Florini’s unique cut-paper collages and oil paintings are consciously executed to present the viewer with a personal story, mood, and sensitivity that can only be “Florini”. Strong design is the foundation for each special piece. 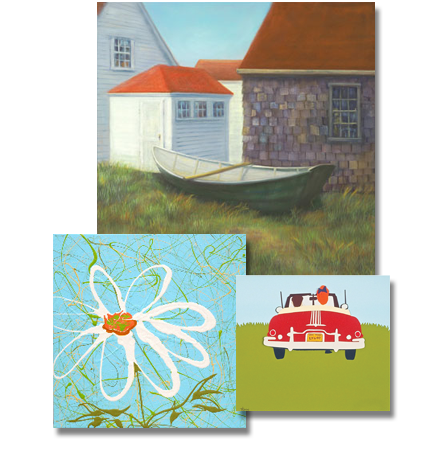 "Clapboard houses, seaside gardens, and vintage cottages are her favorite subjects inspired by summers spent in Maine and on Cape Cod. Adirondack chairs, dories, and classic cars –'just the ones I’d like to have from the 40’s and 50’s' – are characters in her colorful visual stories. A number of Florini’s pictures suggest moments of repose: a book left open on an armchair; a clothesline strung next to a salty old fishing boat; one illuminated window in an otherwise darkened farmhouse. She brings these quiet scenes vividly to life." - Pam Tully Price for North Shore Living. From 1999 to 2015, Florini worked at Beach Street Studios, an artists' studio/gallery created by 3 art partners "from the ground up" -- designing marketing strategies, business materials, and practices, client and vendor relations, accounting and capital improvements to their leased property. All this has contributed to Florini's enthusiasm for creative thinking in both art and business.